Loved by numbers of big name professional guitarists, the Deluxe Memory Man pedal gives you great quality, analog delay with chorus and vibr.. Loved by numbers of big name professional guitarists, the Deluxe Memory Man pedal gives you great quality, analog delay with chorus and vibrato. The Memory Man pedal is used by a great number of star guitarists from The Edge of U2, David Gilmour of Pink Floyd to Jack White of The White Stripes and Smashing Pumpkin’s Billy Corgan… plus many more! 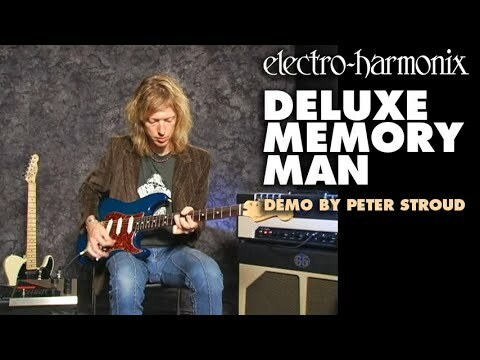 That’s got to be because the Deluxe Memory Man gives you a long 550ms of great echo along with awesome chorus and vibrato effects to further flesh out your sound. Not to mention the fact that the delay is all analog, giving you an unbeatable, organic delay sound. The Deluxe version of Electro-Harmonix’s Memory Man delay pedal gives you extra settings options so you can really get the most of your sound. The BLEND control allows you to adjust the mix of direct and delayed signals. The FEEDBACK dial allows you to adjust the number of delay repeats. The DELAY control allows you to set the time between direct and delayed signals and the time between the repeats when feedback is used. All sorts of unique and unusual pitch-shift effects can be created by changing the delay while playing, especially when utilising the feedback control. CHORUS and VIBRATO controls allow you to add further effects to compliment your analog delay making this a great bit of kit for creating some unique and high quality sounds. With a Deluxe Memory Man pedal as part of your pedalboard arsenal, you're never short of incredible sounds to add depth, dimension and dynamics to your performance. With all the added functionality of the Deluxe Memory Man and the fact that it is an analog delay pedal, a quality that is much sought after and fairly rare nowadays, makes this a fantastic delay pedal to add that extra layer to your playing or as another member of your effects arsenal.